What is Vital point of sale? Vital point of sale is a family of flexible, customizable point of sale solutions that help you run your business. An affordable, fully mobile solution that lets you run your business using using a compatible smart phone — anytime, anywhere. 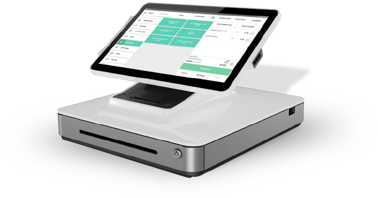 A simple in-store solution that's the lets you run your business from a single, all-in-one countertop device. Built for busier, more complex in-store environments that need our fastest, most full featured and largest point of sale options. Accept all major credit and signature debit cards. Also, tracks and manages cash payments. Payment methods include chip cards, contactless and magstripe. How do I know if Vital is right for my business? Track and manage time and attendance, understand staffing needs, helps you gain efficiencies. Which Vital Solution is right for me? We offer a number of solutions to support many different business types and environments — if you're not sure which Vital solution is right for you, contact your Vital sales representative. How does Vital handle inventory? Vital gives you real-time data that helps you maximize sales, stay in stock, and on top of your business. Now you can take the work (and guesswork) out of time-consuming tasks like, "weekly specials", "low stock" alerts, and "check ID" prompts. How many Vital point of sale devices can I run simultaneously? You can configure your set up with multiple Vital points of sale to meet your needs — whether you want multiple checkout options in your location or have multiple locations you want to manage all from one easy-to-use back office. Is it possible to manage Vital remotely? Yes. Vital is a cloud-based platform which provides a single administrative access point across all Vital point of sale products, requires less maintenance, and is easy to learn and use. You'll get extraordinary functionality — including a level of business management support such as inventory management, time and employee management, and reporting — previously only available to considerably larger companies. What kind of support do I get with Vital? A Vital point of sale specialist will help you get set up and running. They'll help you get your inventory onto the platform and build your on-screen menus. From there they'll train you on your solution and support you every step of the way. Once you're set up, you'll always have access to robust self-service tools and 24/7 live customer support. Typically, business that don't have a complex offering or inventory and want an affordable, mobile solution to accept cards, including chip credit card payments on a personal mobile device like a phone or tablet (Android™ or iOS). What types of businesses use Vital Plus? Vital Plus is ideal for businesses that are busier and bigger than those that might opt for using their personal mobile device and often still use a cash register and a 10-key keypad. Vital Plus offers more item control and reporting than traditional payment terminals or cash registers. How can Vital Select help my business? This is a game-changer, providing better insights into information about payments and business operations than competitive payment offerings. Evaluate how employees are performing, which days are the busiest and may require more coverage, which items in inventory are selling and which aren't, and more. With Vital POS, you gain a much clearer understanding of the dynamics of your business. All trademarks contained herein are the sole and exclusive property of their respective owners. Any such use of those marks without the express written permission of their owner is strictly prohibited. The affordable, fully mobile solution that lets you run your business using your smart phone – anytime, anywhere. Built for busier, more complex, in-store environments that need fast, full-featured and larger point of sale options.